A few examples from my code. Here are a few handy ASCII diagrams for recording circuit setups inside of your Arduino sketches. I’ve found that making a habit of this is as important as commenting the code. These may look a little funky in your browser but they will line up nicely in plain text Arduino sketches. Update: for some more current Arduino version ASCII pinouts (Mega, Uno, etc. 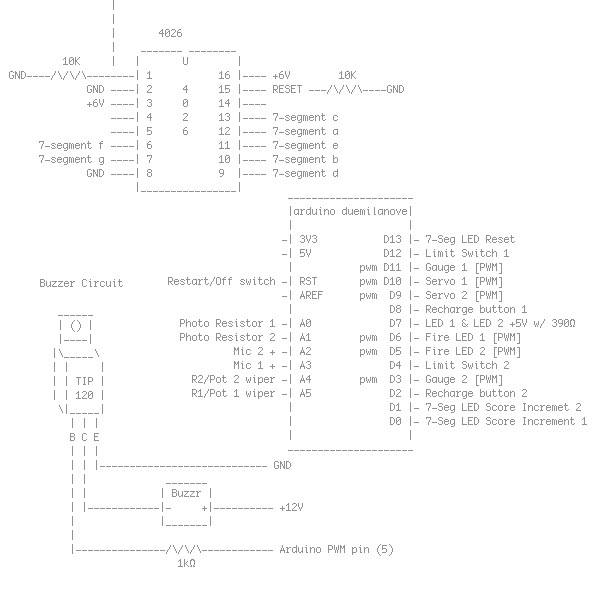 ), check out http://busyducks.com/ascii-art-arduinos. --------------------- |arduino duemilanove| | | -| 3V3 D13 |- -| 5V D12 |- | pwm D11 |- -| RST pwm D10 |- -| AREF pwm D9 |- | D8 |- -| A0 D7 |- -| A1 pwm D6 |- -| A2 pwm D5 |- -| A3 D4 |- -| A4 pwm D3 |- -| A5 D2 |- | tx D1 |- | rx D0 |- | | --------------------- 16-pin DIP ---------------- | U | ----| 1 16 |---- ----| 2 15 |---- ----| 3 14 |---- ----| 4 13 |---- ----| 5 12 |---- ----| 6 11 |---- ----| 7 10 |---- ----| 8 9 |---- ---------------- 8-pin DIP ------------- | U | ----| 1 5 |---- ----| 2 6 |---- ----| 3 7 |---- ----| 4 8 |---- ------------- TIP120 Transistor ______ | () | |----| |\_____\ | | | | | TIP | | | 120 | \|_____| | | | B C E | | | 7-Segment Common Cathode LED Display |----------------- 1. | |-------------- 3. | | |----------- 5. | | | |-------- 7. | | | | |----- 9. | | | | | -g--f-----b--a- | a | 7 d | ===== | c c s i | f|| ||b | o a e s | || g || | m t g p | ===== | m h m l | e|| ||c | o o e a | || d || | n d n y | ===== | e t | O | -e--d-----c---- | | | | | | | | | |----- 10. | | | |-------- 8. | | |----------- 6. | |-------------- 4. |----------------- 2. | | | |-------- 7. | | | | |----- 9. | | | | |----- 10. | | | |-------- 8.